Less to relate this week than usual, unfortunately. Last week, not too long after I sent out my last newsletter to you all, I went to kickboxing training, as is my wont. During said training, I was struck in the head several times, not particularly hard. Later that night, I developed a headache, dizziness, and nausea. After several worried phone calls in the middle of the night to ascertain that my brain was not going to swell up and kill me in my sleep, I went to the doctor the next day. He told me that I have suffered a “head injury” (not a concussion, though it sure feels like one). I discovered on my own that that meant that trying to read or write for long periods made my brain think it had gotten on an amusement park ride. So my last week has been very unproductive, as I’ve been reduced to working in 10-minute stints for a few hours a day while I recover. Trying to push the envelope on that, which I have done several times, has proven unwise. In short, everything’s on hold except for paid work, until my brain sorts itself out. Which is too bad, because there are still a lot of exciting things on the horizon. 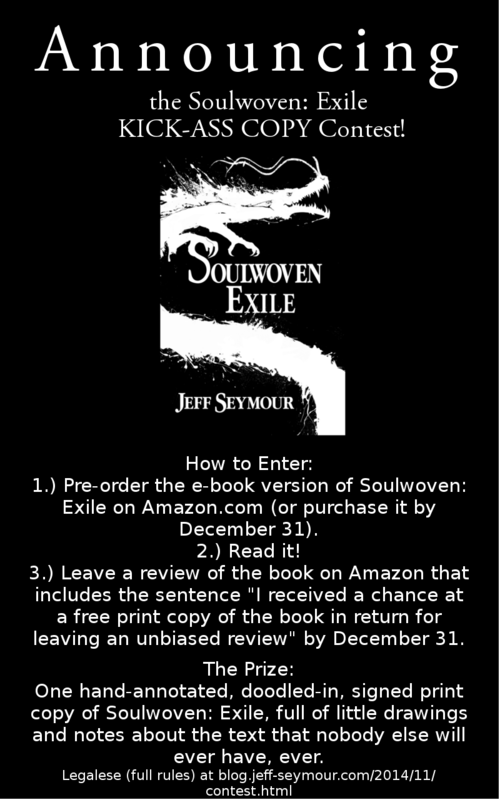 I’ve almost finished the first bit of Soulwoven bonus content for you (an Aleani language primer) and am pondering how best to launch it, and revisions on Nadya and design work on Three Dances were going very well until my injury. Next week, I travel to the East Coast of the U.S. to spend the Christmas holidays with my girlfriend’s family. Hopefully, by then, I will be back to writing again. You can sign up to receive these newsletters via e-mail here.